California 6, Pioneer 1 — Brianna Saldana scored twice and had two assists and Viviana Ramirez, Vanessa Quintanar, Lezlie Guerrero and Paola Iniguez each scored for the Condors (9-6-4, 5-1-0) in a Del Rio League victory. Kiana Jones and Ramirez each had an assist. Maria Nunez scored for the Titans (8-7-2, 1-4-0). La Habra 10, Fullerton 8 — Natasha Velez scored eight goals, goalie Jocelyn Meza had nine saves and Lindsey Potter and Jessica Calderon each scored a goal for the Highlanders (11-8, 3-1) in a Freeway League win Wednesday. 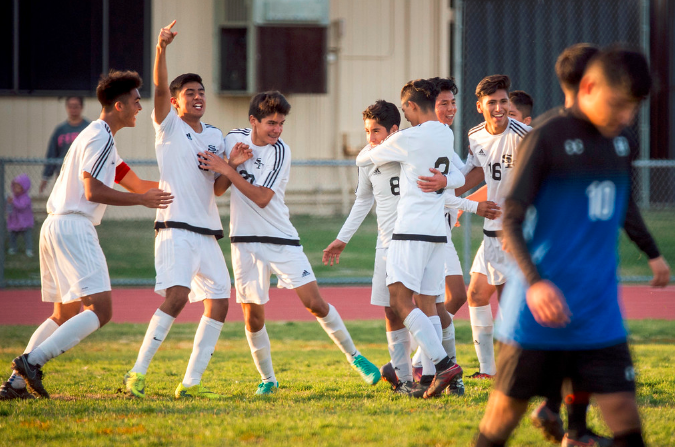 SANTA FE SPRINGS — The race for the Del Rio League boys soccer championship is fit to be tied. Juan Rodriguez Bugarin scored from inside the goal area in the 58th minute and host Santa Fe High School took a 1-0 victory over El Rancho on Wednesday to pull even in the league standings with the Dons. Christian Guerrero had the assist and Maquech Lizarraga had five saves for the Chiefs (12-3-1, 5-1). Carlos Mendez had five saves for El Rancho (14-2-2, 5-1). El Rancho, ranked No. 1 in the area, won the first meeting 4-1 on Jan. 10. The Chiefs are No. 2 in the area. Santa Fe, which outshot El Rancho 13-11, got its chance for the lead following a foul just outside the penalty area with 22 minutes left to play. The direct kick glanced off El Rancho’s Andrew Martinez in the penalty area before deflecting off Guerrero to Bugarin, who put a shot to the left of Mendez for the 1-0 lead. 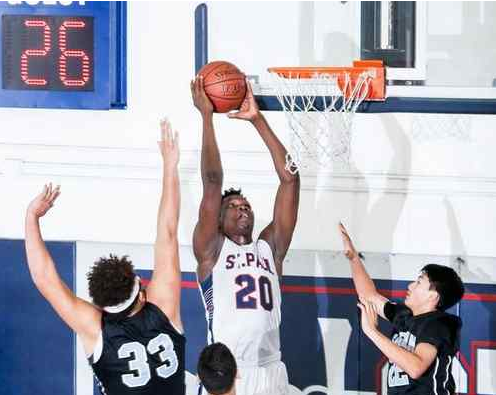 SANTA FE SPRINGS — The road to the Santa Fe League boys basketball title will again run through St. Paul High School.Louis Bangai scored 29 points and had 13 rebounds and the Swordsmen took a big step toward repeating Wednesday with a 57-42 victory over Salesian at St. Paul High. Kylan Mann also had 16 points on three 3-pointers for the Swordsmen (16-4, 5-0), in a battle for first place. Efren Lemus had 15 points and Kenji Pallares had 10 points and six rebounds for the Mustangs (10-11, 4-1). The key point came after the first quarter. St. Paul, after giving up 17 points and five 3-pointers in the opening quarter, yielded just six 3-pointers for the rest of the game while holding Salesian to nine, eight and eight points in each quarter to outscore the Mustangs 38-25 over the final three quarters. St. Paul, after Lemus hit a 3-pointer to tie the score at 25, closed the half with a 7-1 surge to lead 32-26 at the break. Bangai had a dunk and Nate Kasongo a 3-pointer to open the third quarter with a 5-0 run for a 37-26 lead before ending the third and beginning the fourth with a 7-0 surge to all but seal it at 50-34 with six minutes remaining. Whittier Christian 67, Pioneer 53 — Justin Osborn had 17 points and 10 rebounds, Quinn Commans added 10 points and had seven rebounds and Justin Turner had nine points for the Heralds (15-7, 2-2) in a nonleague win Monday. Montebello 50, Alhambra 31 — Kyannie Brown scored 15 points and Alisia Trejo added 12 points for the Oilers (16-6, 4-1) in an Almont League victory. California 4, El Rancho 0 — Elvia Villagomez scored twice, Brianna Saldana scored a goal and had two assists and goalie Angie Guerrero had a shutout for the Condors (8-6-4, 4-1-0) in a Del Rio League match. Also for California, Andrea Paniagua scored a goal and Paola Iniguez and Viviana Ramirez each had an assist. WHITTIER — There is a misconception that the La Serna High School boys basketball team is Cedric Sobers and friends.The Lancers showed otherwise Friday. Walter Franco scored 13 points, Daniel Canales had 12 and La Serna demonstrated its depth with a 73-55 victory over host Pioneer in a game for sole possession of first place in the Del Rio League. Izaaak Mills and Jacob Fuller had 11 points each for the Lancers (18-2, 4-0). Sobers, saddled with foul trouble before fouling out in the fourth quarter, had nine points. Khieem Williams had 17 points and Mike Vasquez 13 for the Titans (15-4, 3-1). La Serna also got nine points from Rene Favela, who was 3 of 4 from 3-point range. The game turned during the second quarter after La Serna outscored Pioneer 24-11 to lead 38-21 at halftime. The Lancers, getting a 3-pointer by Canales and a three-point play by Franco, opened the quarter with a 16-7 surge for a 30-17 lead with 2:06 left in the half. Mills followed with a layup and 3-pointer to key an 8-0 blitz to close the half for a 38-21 advantage. La Serna all but sealed it by beginning the third quarter with a 7-0 run for a 45-21 lead with 6:05 left. Pioneer, getting 12 points in the second half from Williams, twice cut it to 14 in the fourth quarter before Sobers converted a three-point play and Fuller made a layup to seal it at 65-48 with 3:20 remaining. 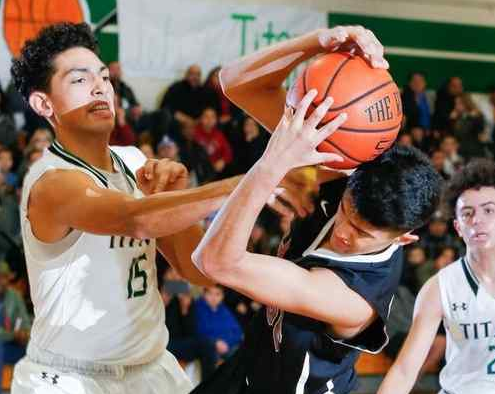 SAN GABRIEL — One season ago, the San Gabriel-Schurr High School boys basketball matchup was an afterthought in the Almont League as the two teams struggled through a difficult year.Fast-forward to this season and these two squads are enjoying similar successful turnarounds. It might be fitting then that they would play a tight game that needed a little more time to figure out a winner. San Gabriel’s Preston Savayong, however, wasted no time as he sank a free throw with 3.7 seconds left in overtime to give the Matadors a thrilling 71-70 victory over the visiting Spartans on Friday night. The win gives the Matadors (15-4, 4-0) sole possession of first place. Savayong’s game-winning free-throw was set up due to a mistake by Schurr (15-6, 3-1). San Gabriel’s Andrew Canizal banked a 3-pointer from the top of the key to tie the game 70-70 with 5 seconds left in overtime. After the Spartans in-bounded the ball, a timeout was called. However, Schurr didn’t have any left. That resulted in a technical foul which gave San Gabriel two free throws plus the ball. Savayong finished the game with a team-high 23 points. That 23rd point proved be tougher than it looked. He missed the first free throw but then hit the second to give his team the victory. Jaedyn Bonilla led Schurr with a game-high 25 points. He hit big shots and free throws. He nailed a 3-pointer to give his team a 56-55 lead with 3:23 left in the fourth quarter. He also hit all four of his free-throw attempts in overtime. The last free-throw gave Schurr a 70-67 lead with 22.3 seconds left.